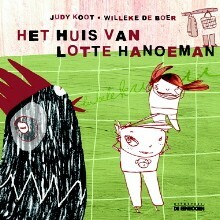 Het huis van Lotte Hanoeman (The House of Lily Hanuman) is a Dutch children’s picture book written by and created under art direction of Judy Koot. With contemporary collage-style illustrations by children’s book illustrator Willeke de Boer, and experimental typography designed by artist and designer Mitar Vasić. In 2003 the drawings were selected by and exhibited during BolognaFiere (International Children’s Book Fair Bologna, Italy), and traveled to Japan where they were exhibited in several museums. In 2005 Belgian publisher De Eenhoorn published the book in a limited edition (note that the book will not be reprinted, and there are only a few samples left). The story is about a day in the life of a little girl named Lotte, who lives in a colorful house near the ocean, and her lively friends. The book was well received by both Belgian and Dutch press, describing it as a “modern Pipi Longstocking” and “striking, dreamlike story,” and comparing it to the books of Lauren Child. This book is almost out of print, so it’s hard to come by. A few copies are still available at Judy’s online store (ships worldwide from the Netherlands).